A few years back I finally completed my Basic / Expert D&D set collection. I'll post pictures first, maybe chat about some rules later. I'm proud of the fact that I was lucky enough to start with the red box basic set because all the later boxes match. My redbox was mocked by friends and in White Dwarf for dumbing down, i.e. teaching a new player with solo text. It also didn't contain B1: Keep on the Borderlands, which was a genuine shame. I was flipping through a forum the over day and was baffled by the acronym "BECMI". About three threads later I realised that they were talking about Dungeons and Dragons: Basic, Expert, Companion, Masters and Immortals. When I was into Basic D&D, my loyality seemed unfashionable and I eventually gave in to the newly re-covered AD&D rules. But to be honest most of my friends were still playing it like Basic, so the change was really about extra weapons, classes and spells (and no-one I knew used the weapon vs. armour class matrix, or helmet rules, and I think we simplified initiative, so I guess we were really home-brewing back then and didn't know it). Also, a majority of articles in White Dwarf and Dragon were written for AD&D. So I'll resist waffling about different editions. 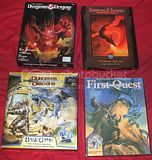 Other random boxed versions of D&D I've procured because the were complete sets that I reminded me of the Basic/Expert game or complete introductory games. Prizes if you can date them. Ah great stuff! Looks like this is going to be a popular thread with us gaming nostalgia junkies. as you can see my collection of the Basic, Expert (and so on) D&D books is rather lacking consisting as it does of the Player's Manual, Dungeon Master's Rulebook (1,2 and 3 respectively). Dungeons & Dragons: Caves of Shadow (4) is an introductory game that either came free with Dragon Magazine or was a freebie that game stores handed out (I don't remember which). The games is entirely D6 based, I assume to make it more accessible to new players and feature 3rd edition's mascot line up of Regdar, Mialee, Jozan and Lidda. The whole 'game' was one booklet consisting of some basic rules character sheets and a short adventure. The aim of the booklet was to get you to want to buy the “Dungeon and Dragons Adventure Game” which I believe is the game Big Cat started out with (not to be confused with the 'Dungeons and Dragons Fantasy Adventure Board Game' or any number of other similarly named D&D products). CM1 Test of the Warlords (5) I won't spoil the plot here, but it's very good adventure set in a land called Norwold with plenty of action, Royal intrigue and barbarians. The book has really good artwork and some nice maps through out (I believe this module is an old favourite of ScumDog47). X1 The Isle of Dread (6) what can I say ... a jungle island with a mysterious ruined temple, populated by natives and dinosaurs. Not really to my taste but an interesting adventure none the less. M2 Vengeance of Alphaks (7) another adventure set in Norwold with the PC's trying to stop a huge war breaking out between rival factions, a war which may destroy both sides. M1 Into the Maelstrom (8) flying ships, Star Kingdoms and a swirling sea in space, a little too close to SpellJammer for my liking, but the naval combat rules are interesting. XS2 Thunderdelve Mountain (9) a very nicely written Solo Adventure (with options for running with a small low-level party) unlike a lot of other Solo Games this adventure is free roaming and allows you to go back on your self, which means you can explore the dungeon in any order you like. An Event Record (based on ticking off a chart of letters) keeps track of what you have encountered, any major characters or monsters you've killed and what events you have triggered in doing so. This means that the actions you perform may effect what's happening elsewhere in the dungeon. For instance killing or not killing a creature in one room will effect weather you run into the same creature again later or what an NPC might being be doing when you encounter them or go back to the same room several times. Having the letter based system to keep track of events rather than asking direction questions about what you have done (like in FF books) also prevents any cheating! The art work is great and the book also contains a lot of interesting 'handouts' which give you clues at various stages of the adventure. Although rules wise it's more akin to HeroQuest than it is to D&D I feel the Dungeons and Dragons Fantasy Adventure Board Game is worth a mention here as the flyers included in the box make it clear that it's intended to get people hooked on playing fantasy games with the hope they would later want to purchase D&D 3.5 rulebooks to continue gaming. The so called 'Easy to Master' Dungeons and Dragons Game, was the first D&D set I owned. It was released around the same time as HeroQuest and intended for the same sort of age group. However the basic D&D rules are a lot more complicated than HeroQuest. the Rule Book contains pretty much all the rules you need to play low-level (1-5 ) games. It's some-what like an abridged version of the Players Manual (minus the solo adventure) and Dungeon Masters Rulebook from the Red Box rolled into one. The book covers Character Generation, the Game rules, Spells, Treasure, how write Adventures and even contains a fairly long list of Monsters, like I said it covers pretty much everything in one book. What makes this different from others is the 'Dragon Card Learning Pack' – a pouch of loose pages attached to what claims to be the Dungeon Masters Screen (and as such prevents it from standing up and being used as the DM's screen). This thing a nightmare and most of it's troubles stem from the fact it seems to have been designed by someone who had their head stuck in filing cabinet ... it's supposed to take new players through the D&D game step my step, first teaching them about the 'funny dice' and then taking them on a solo adventure through the basic rules of play and then running their first couple of games. The loose-leaf format hinders rather than helps here and is made all the worse by the solo adventure being printed on one side of the pages and the introductory guide to the rules in a Questions and Answer format being printed on the other. Let me reiterate that for you: 2 different sections of text are printed literally back-to-back on alternate sides of the same pages ... and god help you should you accidentally drop the thing and all the pages fall out ... I quickly learned not to touch the Dragon Card Pack after having to figure out what order the pages were supposed to go in one too many times. And that is how I learned to play D&D! By far the nicest thing in the box is the Zanzer's Dungeon map/floor plan. It's a rather nice little dungeon with prison cells, a small mine and a rock sorting room with hand-driven conveyor belts, among other features. The game also came with a bunch of A-shaped little card stand-ups of various monster - some with a different creature on each side for some reason - for use with the map, but this didn't really bother me at the time as I already had the miniatures from my HeroQuest set and a box full of old Citadel AD&D miniatures I had been given. I've actually used the dungeon map for WFRP and Mordheim more than I have for D&D. Feeling brave tonight? As Mr Babble pointed out I also own Dragon Strike which again is intended as an introduction to D&D. I picked up Dragon Strike second hand off a collectables/gaming stool at an indoor market around about 2003/4 not really knowing what it was at first (I have a compulsion to buy anything with the TSR logo on it!) but realising it was supposed to be a competitor to HeroQuest and had something to do with D&D (it shares some art work with my D&D boxed game). The rules aren't much like the D&D rules but the basic principals are the same. Most people know Dragon Strike for it's (im)famous VHS, but the game itself is worth some attention on it's own merits. In fact I think Dragon Strike probably deserves it's own thread, so I won't go on about it here. However what might be of interest to this thread is the flyer that was included in the box advertising other TSR games available at the time. I've always found it some what amusing that the advert for the Easy to Master Dungeons & Dragons Games, kinda implies that the aim of the game is to hunt and kill dragons. I applauded that set when a friend gave it to me because the rules were 95% similar to the Basic game and it went up to 5th level. This meant the inclusion of dragons and larger monsters could be justified. I have an almost by-wrote rant about first level characters being killed off by vermin which can be very negative for starting players, but a party of 3rd-5th level characters is ideal for more heroic quests. So I think that this was a really positive move by TSR (despite it going against tradition). I only acquired this edition relatively recently, it's made up of a rulebook, figures, DM's screen, large map, press-out monsters - no fiddly "Dragon Card Learning Pack", incidentally. Ace photos as always - guarded by the trade mark Mortis Goblin. I've acquired a copy of the "Holmes" edition of the Basic rule book. * Code in the upper right is "1001"
* Angled yellow banner in upper left says "Basic Set With Introductory Module"
* 48-page rulebook: Wizard logo, with "2001" in upper right. Inside says "Second Edition, Nov 1978"
What's interesting about this set is that the rules go up to 3rd level, but there are no references to an Expert set of rules, just numerous plugs for Advanced Dungeons & Dragons. There seems to be quite a bit of speculation of line about how this came about and possible disagreements between Gygax and Arneson. This is the set Big Cat (Cat Black here on the forum) first started out with playing D&D with her sisters circa 2000 (I'll try and [dire] badger her into making a post about it too). I got to play a few games using this set recently because Little Kat wants to run a DragonLance inspired D20 campaign and Me, Axl and Big Cat have been using this set (supplementing the card counters with some miniatures and the doors from Axl's HeroQuest box) to teach her to DM/GM. But the Acaeum entry talks of a set that came out before D&D 3rd edition (D20 system) which is interesting because I always assumed Big Cat's set had come out shortly afterwards to introduce new players into D20. The set shares almost all it's artwork -including the D&D logo- with the 3 'core' D20 books (PHB, DMG, MM), in fact the D20 Players Handbook has a scaled down version of the same dungeon map on it's last page. This leads me to believe Big Cat's version is probably a version unique to the UK (the bag the dice came in has a little 'Made in the UK sticker') that Acaeum may not be aware of (it might be worth us contacting Acaeum and showing them this thread). Seriously what are TSR/WotC trying to do with having all these different versions? Copies of D&D seem harder to keep track of than Nintedo games! The set is currently over at Axl and Little Kat's place, I'll try and inspect it more closely next time I'm over there. I remember an old TSR catalogue I have kicking around somewhere has he D&D Rules Cyclopedia in it, I'll dig it out some time and see if I can find out more about it. I've heard several rumours about the reasons for the separate D&D and AD&D during the 2nd editon era. Some revolve around Arneson wanting a simpler, less rules heavy game more in keeping the games they'd first played back in the early days. Others talk of a financial dispute between Gygax and Arneson, in which several law-suits went back and forth over the royalties of D&D, leading TSR into doing a rather sneaky move by which AD&D was promoted as the main product, which Gygax got full credit (and money) for and TSR kept basic D&D around as product but didn't promote it as much. Meaning Arneson because of the wording of the law-suits got a cut of the money from D&D, but had no rights to a cut of the money from the (deliberately made) more popular AD&D. Of course there are as many variants on the myth as there are people with loyalties to each game and/or Gygax and Arneson themselves. There's no real solid evidence either way save for Gygax being notoriously boastful and willing to take credit for things and the fact that AD&D wasn't necessarily any more 'Advanced' than basic D&D in all it's rules. Well done with finding Red Box rules on Scribd! I gotta say that site is a treasure house, I've downloaded at lot of PDFs of old D&D modules from there in the past, look out for one on there called 'Goblin's Lair' which appears to be an expansion for my “Easy to Master” set (and thus your “The Classic” too) it's got a couple of nice adventures to run, a kinda mini-game too, plus more 'Zanzer's Dungeon' style maps! I'll post photos of the interior some time. Many of the character pictures in the pre-gen sheets are taken straight from Dragon Lance. Definitely no card counters. Kat's DnD set (nice condition!) was produced by Wizards' either during or after the buy out of D&D from TSR. "Indexes of all Dungeons & Dragons items produced by TSR up through roughly 1989. These include descriptive text, cover scans, estimated auction values, rarity, and other minutiae." Kat's set is one of several intro-box games which game out after 2000, but I'm having trouble tracking down edition details. It was almost certainly launched as part of the same product line as the DnD 3/d20 Core Rulebooks. Wikipedia seems to mainly list hardback editions only - I'm guessing that introductory/basic/starter sets are seen as accessories to the core rules. I remember seeing it a few years back and then I'm sure something similar came out again for 3.5. Okay, I'm flailing in the dark. I need a catalog list - I'm sure Kat's game (or something with a similar cover) was listed in the 2000 Wizards Catalogue which I thought I had at home - naturally I'm not at home at the moment. D'oh! One of two sets, perhaps ...? An expansion set of some kind? Anyone else got any pointers to recent products? I've been enjoying some words "from the horses mouth" recently with regards to Arneson and Gygax. Frank (Red Box and a ton of other stuff) Mentzer hints at some of what went on at TSR on page three of a Q and A with Frank on the Dragonsfoot Forums. Makes you wonder about "intellectual property" and the like. This is my problem with low level D&D (all flavours) - especially as a way of introducing role playing to newbies. My fantasies about writing solo D&D games become utterly crushed when you realise that the first level game requires an absolute minimum of four fighting characters I reckon. It's fun for experienced players to suffer at the hands of centipedes, fungal spores, rats, nausea, one successful strike, tripping damage etc. - but its an anathema for a new player wanting to be a "hero" - remember that it took nearly half an hour to roll the damn character up - their reference points being Conan, King Arthur whatever. ...But that's for another thread ... blah blah. -4 Save vs. Mortis's humour. Fail=spleen damage 2-12 hp. Another game worth adding to this thread is the most recent addition to collection: DragonQuest. I've mentioned DragonQuest before in passing when I talked about the fliers that came in the Dragon Strike box, but now that I own it I feel more qualified to talk about it. As often happens I got carried away when writing and I've actually written about 2 pages or so of text about DragonQuest so I though it better I started a new thread. Okay, I really struggle with fourth edition core rules, I really don't need another boxed set - another introductory set. But because it looks like the old red box I'm drooling. I'm such a gimp! I think I'm about to have that same experience that Mortis had with the new WHFRP. When I saw the classic "red box" I said: "It must be mine!!!" But when I saw the review ( ) I said "It's better to give up"
4. Uhm... I don't know... The opportunity you can buy it but you are not forced to play it? The opportunity you can buy it but you are not forced to play it?